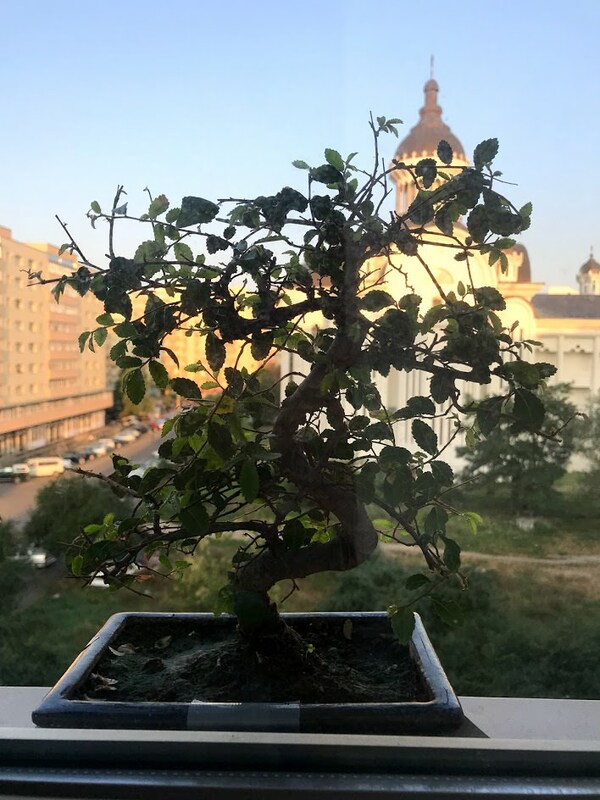 So i've been having this great Chinese Elm tree for almost 2 years now. Hes been mostly kept inside ( last winter he was fully inside in a rather cold balcony facing the window ) and he did .. okish. I read online a lot about all kinds of methods, all kinds of places to put him during winter as soon as the first frost arrives, but in my case its either outside in minus temperatures or inside in plus temperatures and I literally dont know what to do. Putting him in the refrigerator for 40 days with a constant 5c temp doesnt sound bad at all but I am afraid im gonna kill him. Please, any idea/suggestion is more than welcome! I do not think that U. parviflora is frost hardy in your place ( you have mentioned temps around -20°C in Nov/December ). Although the frost hardiness would also depend on the region the cultivar come from your climate is based on my knowledge too cold. Bringing the tree inside should not kill it. It will drop leaves I guess because of the stress but it should make it. For the next winter try to find better solution for overwintering outside. Look here for an idea http://janinbonsait.blogspot.com/2018/11/talvetuslaaatikko.html and check the blog. I think that if you add a heating mat with temps control it will be OK. A thick layer of snow to cover the box works as a great insulater as well. Vlad wrote: I do not think that U. parviflora is frost hardy in your place ( you have mentioned temps around -20°C in Nov/December ). Although the frost hardiness would also depend on the region the cultivar come from your climate is based on my knowledge too cold. If it is frost hardy and I think it probably is, it will not survive on the balcony, it must be in the ground. It will deteriorate in health year by year if it does not have a dormant period. I have been heard this a number of times and been assured that Chinese Elms can take -20 C. I bought a Chinese Elm from a grower about 4 years ago, he said it had come from southern China via 4 months in Florida at his suppliers. He could not say it would survive our winter, I looked online and found an assurance at Bonsai4me that it would. I was still nervous about putting a tropically grown tree outside in a Canadian winter in one go (it can be -30 C). so I put it in a bar fridge @ 2 C, it did fine, no problems. The next year it went in the ground outside and has been fine ever since @ -20/-30 C. I have pics but can't add them, no attach button. I just looked at the container in the above link, that looks good, I don't know for certain what the difference is between in the ground and not. 1 week at -20 and the ground and the root ball are also at -20, the only difference I can see is how slowly and how often the freeze/thaw process occurs. So it would make sense that an insulated box could work but I would get rid of the plastic top and replace it with a lid also lined with styro and maybe thicker styro. Once dormant below 4 C it does not need light and probably not much air circulation either. I would like to try this myself with small less important tree. As for the fridge he pics I have show what I did, take a long piece of heavy bonsai wire, put both ends in the soil looping out and above the tree, next put a plastic bag over the wire and tree and down the side of the pot. The pot with the tree goes in a second pot with the bag hanging between the two pots, the humidity is in any condensation drips into the second pot. Put some water bottles in the fridge with the tree so you water at the same temperature. Mine was in there 60 days, I checked it but only watered once right at the end, probably because of the plastic bag. I then I got nervous and took it out (it could have stayed there 3 months, or what ever is most convenient for you, it's hassle to have a tree like that in the dry winter air of the house) ,leave it in the fridge or take it out & leave the plastic bag over it for humidity until the weather warms up, bend the wire to make sure the bag does not touch the leaves. Inside I have a temp controller that turns a fan on at 70F degrees so it doesn't get too hot in the winter yes in the winter without the fan inside temps can reach 100F degrees in the sun. The controller also turns on a heater at 50 degrees when it gets to cold at night. I have a indoor out door temperature monitor so I can record and monitor the hi-low temps. Today our weather has been 34F high and 21F low The mini green house in the last 24 hours has been 61F degrees high with a 51F degree low. The range can be set at any high or low you want so for something you want to go dormant just set it at 35 low with a 45 high. 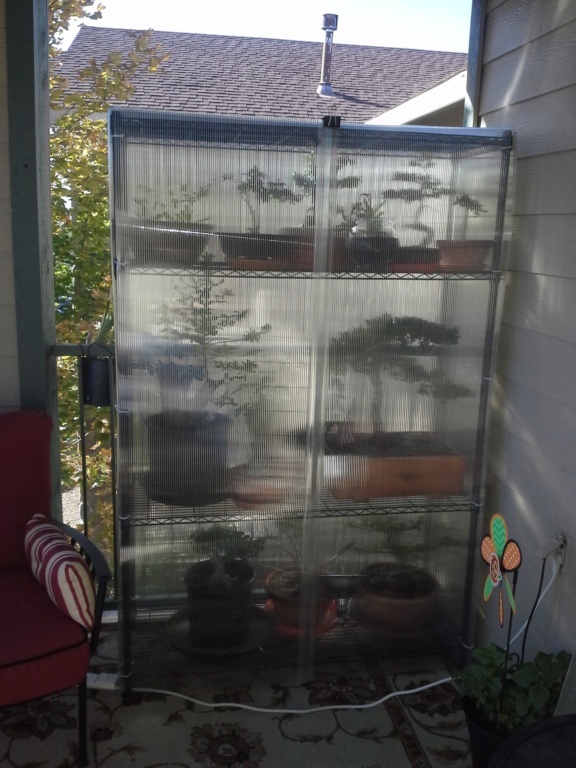 By the way you can grow in this all year but, if your summer is hot like here the inside can hit 125+ with the doors closed so I use hinges with removable pins so I can take both doors off during the summer and have the front completely open. Trees that are hardy need a rest period. There may be some Elms that are tropical, but I've never run across one. Chinese Elms are hardy in Michigan, zone 4 or 5 at least. But. They can be houseplants, too, and live, but they will get ugly before becoming beautiful again next growing season. If you want a houseplant it would be wise to choose a species that is at least tropical, and tolerant of usually crummy-for-plants conditions, with foliage that lasts longer than 12 months. Some, very few of us, have just the right kind of window for something like an Elm, but not many of us. Even if they do have "good" conditions, Elms are not evergreen, they are deciduous and their leaves last less than a whole year, so there will be some period of transition from last year's leaves dropping and this year's new crop leafing out. Depending upon your household conditions, that transition might begin in December and complete the process by April something. The question becomes do you really want to watch it go through the ugly phase, or would it be just as good for you to put it outside, actually, keep it outside, and have it look better almost all year (that you look at it). This applies to other species, too, that can ~live~ indoors over winter, like Boxwood, Ivy, Holly, Juniper, et al that will live towards the southern end of their range, maybe southern Georgia/Northern Florida. There ARE races within these species that are especially suited to their southern ranges, but it's awfully hard to guess if a particular tree is or is not northern raised sold to a southern re-seller then to someone, wherever, or the opposite, ad infinitum. If they have all winter outdoors, they will all be healthier, and grow better. The time they spend in winter is not spent doing nothing. From late summer through winter and early spring they grow roots when conditions permit. That is, when the soil is not frozen solid and not bone dry. At other times, they just park and get ready for conditions that signal the new growing season. Imagine the amount of energy that can be accumulated over 6 or 7 months to support a new head of foliage verses refoliating one leaf at a time while also gathering energy. The difference in the appearance of two Elms or Boxwood, etc., one indoor, one outdoor over-wintered is night and day. Cut and paste from an article I did elsewhere. Elms for USDA zone 5 and zone 4 - these species should be able to be wintered, outdoors, without temperature protection, pot set on ground, protected from wind & maybe sun, mulching in optional. Ulmus thomasii - rock elm, also known as northern cedar elm, but it is not the same species called cedar elm in the southern USA. Native to northern Midwest America, into Canada. Ulmus parvifolia - the Korean ecotype of the Chinese elm and the ecotype from northern China are likely more winter hardy than the southern ecotypes, though I don't think there is any hard data. Chinese elm from southern China may, or may not be winter hardy in zone 5, the northern ecotype has survived through -29 F (-34 C) in trials at the Morton Arboretum in the west suburbs of Chicago. The Chinese elms I have tried, of unknown origin did not do particularly well, but I was not deliberately running an experiment. Cause of failure could have been another factor other than cold. Worth experimenting with different sources. Note, in my experience, the named varieties of Chinese elm, like 'Hokkaido', 'Sejiu' and 'Yatsubusa' all seem to require at least some winter protection. Your best bet to find truly winter hardy U. parvifolia is to try one of the un-named seedlings. If you can find seed sourced from Korea, this is your best bet. Anecdote from a middle Michigan USA friend, 'Corticosa' does survive through Michigan winters, roughly zone 5. Ulmus pumila - the Siberian elm - superior winter hardiness, an invasive species, to keep lower branches from weakening and dropping off, absolutely must have full sun pretty much from sunrise to sunset. If given enough sun, it works well for bonsai. Probably good into USDA zone 3, it is extremely cold tolerant. Nice rough bark even on fairly young trees. Ulmus glabra - the wych elm - this is the most northern, cold tolerant of the European elms - there is a tree or two surviving in Greenland. If you can find it, it can work in zone 4. Ulmus rubra - native to the northern midwest NA into Canada, the Slippery elm, or red elm - looks like an American elm except "chiefly distinguished from American elm by its downy twigs, chestnut brown or reddish hairy buds, and slimy red inner bark" - flowers in spring before leaves appear, and flowers are reddish. This elm is a little bit more shade tolerant than some other elms. Still, full sun is usually best for cultivation. Ulmus minor - the Field Elm - a widespread European elm that is very cold hardy. Possibly invasive in some areas of USA. So the above are either native to the USA or somewhat available in commerce. The few below you are very unlikely to encounter, they might be hardy. This list is only as complete as the information from Wikipedia. There might be some trees I omitted. Apparently someone from the elm evaluation and breeding program at Morton Arboretum, in the western suburbs of Chicago had edited in some good information into Wikipedia. Virtually all elms, or at least every elm species I have seen bonsai attempted with, has performed nicely. I believe pretty much all elms can make good bonsai. All will develop reasonably fine twig patterns. All the leaves will reduce to relatively small size. True that Chinese elm and Siberian elms have leaves that can be kept at 1/4 inch or 0.6 cm, but all the other elm species have leaves than can eventually with ramification be kept at or under 1 inch or 2.5 cm. So where ever you live, if you have elms growing in your landscape, dig one up and give it a try. If, like the west of the Rocky Mountains, USA, you don't have elms everywhere, this list is for the norther group of you. Hopefully all of those in the high plains that wanted to try elms can get a hold of some of the elms from this list.